1779 Engine man at Bedworth Colliery in Warwickshire. 1781 Went to Cornwall on behalf of Boulton and Watt to erect engines. 1789 Working at Wheal Virgin. Designed the inverted type engine and erected the first at Dolcoath Mine. He erected a total of ten of the inverted engines and Richard Trevithick was probably involved in most of them. 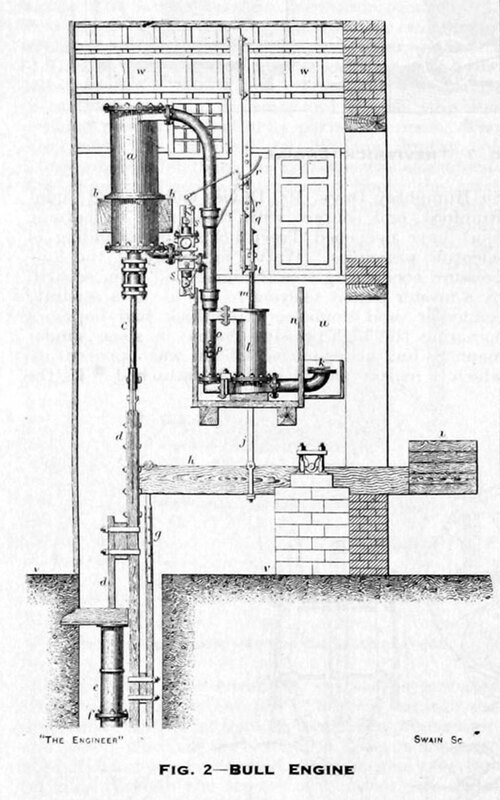 1794 Injunction issued to stop him erecting more engines by Boulton and Watt. 1798 Died age 39 and is buried in Kenwyn Chuch, Cornwall. Had son William Bull who dies in Peru in 1816 / 1818. The Bull engine is named after the Cornish engineer Edward Bull. The Bull engine at Kew Bridge was built by Harvey & Co in 1856, although it was not put to work until 1859. Richard Trevithick – The Engineer and the Man by H. W. Dickinson and Arthur Titley. Published 1934.